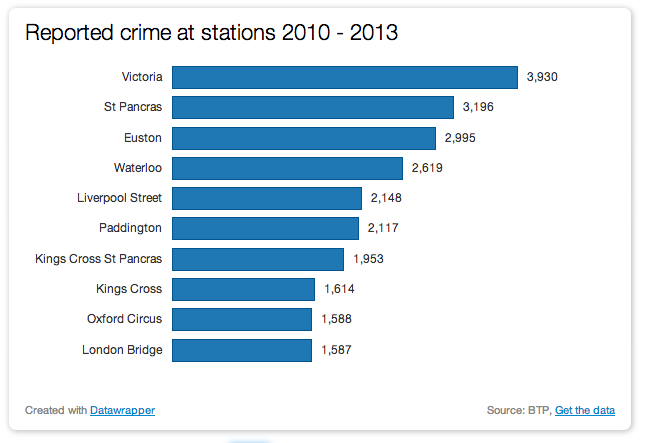 Which London stations are the worst for crime? In December I was very pleased to have the results of my FOI project, part of my MA at City University, published in The Mail on Sunday. I sent a Freedom of Information request to the British Transport Police requesting data regarding crime on the tube, trains, and stations all across London. The finished piece can be viewed here. The data found that First Great Western had the most amount of crime on their trains – with 1,179 reported crimes in 2013. The article also broke down the figures into number of crimes per passenger journey – which found that East Coast trains were the worst. I want to revisit part of the data that was not used a huge amount in the piece – the amount of crime occurring at London overground and underground stations. I decided to look at the figures of total reported crimes between 2010 and 2013 YTD – in order to see what stations had the worst amount of crime over 3 years. However, I also wanted to combine this data with the numbers of visitors at the stations – are the stations that are the worst for crime also the busiest stations? Thankfully, the Office of Rail Regulation release data regarding the number of passengers at stations. The latest figures are based on ticket sales from the financial year 2011-12 – although granted, they are only estimates. I decided to use Google Fusion Tables to map the top 30 worst stations across London, at the same time informing viewers the passenger numbers per station (although unfortunately there was not data on all the stations). Using the bucket function in Google Fusion Tables, I divided the ranges into red or green – to easily show which stations were the worst for crime. I want your opinion on this, would this be better displayed with larger icons and different colours, perhaps yellow and red instead? (Update: I have now removed this element, as I feel it may make the visualisation too distracting). I’d like to include all of the stations, but given that I have data on 706 this may take a while – watch this space! For now, the visualisation can be viewed here. UPDATE: I have now added all 706 stations to the visualisation and the updated version is live here. I managed to find the longitude and latitude data for all the London stations through a Google Table Search. The data was available on Doodal. As the BTP only provided me with the statistics and the name of the station, I then used VLOOKUP in Excel to quickly add the longitude and latitude of each station. Then I simply uploaded the spreadsheet again to Google Fusion Tables. What do you think of this visualisation? What would you change about it? Tags: city university, crime, Data Journalism, data visualisation, freedom of information request, interactive journalism, investigation, Journalism, ma, ma interactive journalism, masters degree, trains. Bookmark the permalink.